At least 79 anti-Donald Trump demonstrators who were arrested in Portland, Oregon after protests turned violent did not vote in the presidential election, according to state records. 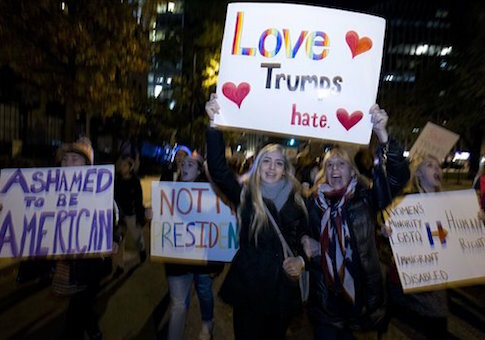 Over 70 percent of the 112 anti-Trump protesters recently arrested during demonstrations in Portland to contest the election results did not cast their ballots for anyone, NBC affiliate KGW Portland reported Tuesday. The news station compiled a list of those arrested by the Portland Police Bureau and cross checked them to the state voter logs by Multnomah County Election officials. Records showed that 39 of the demonstrators were registered to vote in Oregon but did not return a ballot on Nov. 8. An additional 36 protesters who were taken into custody were not registered to vote in the state. Of the 112 arrestees, four were ineligible to vote because they were under the age of 18. Only 33 of the 112 individuals voted in the 2016 presidential election, the results of which they were contesting. It is unclear if those protesters who were not registered to vote in Oregon were registered in another state. This entry was posted in Politics and tagged 2016 Election, Donald Trump, Oregon, Protests. Bookmark the permalink.